I’m so thrilled to share this new little invention with you. It’s called “The Food Heroes Map” and is a constantly evolving map of food heroes from across the world. Are you a food hero? Add yourself to the map! Do you have a food hero that you adore? Add them to the map! Below is a screen shot, to show you what it looks like. 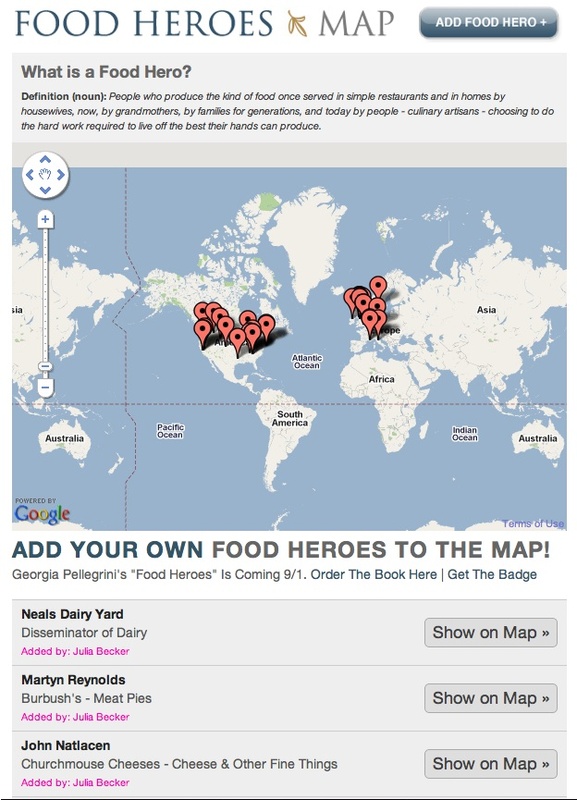 The bottom of the map is a feed which shows you the latest food heroes that have been added by anyone in the world. Whether it’s Russia, New Zealand, or Timbuktu… it’s a way to bring us all together and share our love of food and announce our favorite culinary gems. It will be an especially good resource for you when you’re traveling to an unfamiliar part of the world and want to know where to eat, and which culinary artisans to seek out. And do you know the best way to support food heroes across the world? Embed the Food Heroes badge on your own site! You can have the map available as a resource for your readers as well. I hope you enjoy it and will use it often! The more we all use it, the more everyone benefits.